Look at that good boy! 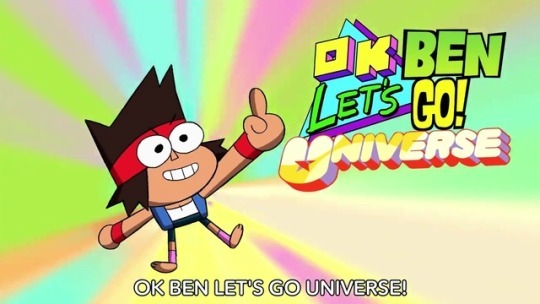 But wait, what's KO from OK K.O.! Let's Be Heroes doing here? While he did show up on our website earlier this year, it's not April Fool's Day anymore. Wait. Could it be....a crossover episode? This certainly wouldn't be the first time for Cartoon Network to do something like this. In fact, OK K.O.! already had two crossovers with two older Cartoon Network cartoons (both which I absolutely loved as a kid). So it looks like KO is going to be having some fun with three more new friends: a young boy that shapeshifts into aliens, the offspring of an inter-dimensional demon, and an alien who is made of love. Huh, makes KO seem like the most average member of the party. Well, either way, let's watch this good little boy make some new friends. The episode, 'Crossover Nexus' premieres tonight at 6:30 PM ET/PT on Cartoon Network (I'm more than positive they'll remind you on the channel throughout the day). If you're like me and have been waiting for this since they announced it at San Diego Comic-Con, we have streams and downloads below the break so you can enjoy right away. Fan Theory: OK KO & CN CIty!? Garnet Meets KO!